Hello everyone, today you can download gotop for Ubuntu and experience one of the best and my current favorite graphical system monitor on any of my current Linux installations, which by the way are Ubuntu 18.04 and Linux Mint 19.1. Today we will highlight some reasons why you should go ahead and try gotop especially if you want a GUI(graphical interface unit) software to use on your command line that will make it easy for you to type your commands, follow what you typed in the past and basically just make your job a lot easier and faster. I honestly still don’t quiet get why some people actually hate GUI software for Ubuntu and Linux overall. I get that the MS-Dos look is nice and standard but having a GUI makes my job easier especially if I want to quickly track down something with my eyes first instead of even typing a certain command. I am leaning towards GUI enabled apps for almost everything. How about you? Let me know in the comments what you think. 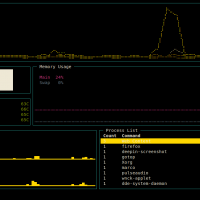 gotop is a terminal based graphical activity monitor inspired by gtop and vtop and written in the Go language. 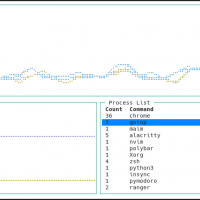 The growing command line tool already supports mouse clicking and scrolling, plus it comes with vi-keys, and it displays the CPU, memory and network usage history using colored graphs, while also displaying their current values. gotop also shows the disk usage, temperatures and a top process list, which includes CPU and memory usage.